Currently, Addons for Microsoft Internet Explorer, Microsoft Edge, Google Chrome and also Mozilla Firefox are available. Since the installation differs depending on the browser, it will be discussed separately here. The Internet Explorer addon can be directly installed together with the client. For this purpose, there is a corresponding option in the installer that is activated by default. Alternatively the Google Store can be reached via the SSO Agent. To do this, right-click on the icon to open the context menu. 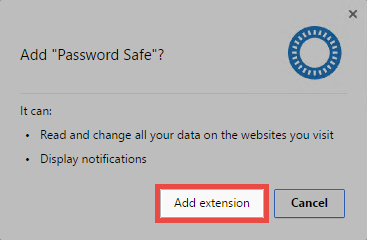 After another click on install browser addons, the Google Chrome addon can be selected. You will be redirected directly to the Google Store. You can start the installation by clicking on Add. The addon will now be installed and the icon added to the browser. After the download, the archive has to be unziped. After that the addon is simply dragged and dropped into the browser. After confirmation, it will be installed and an icon created in the menu bar. After the download, the addon is simply dragged and dropped into the browser. After confirmation, it will be installed and an icon created in the menu bar.